Poppy is the first book I've read by Mary Hooper, although I've had her book Fallen Grace on my to-be-read list for quite a while now, and I was excited to finally have the chance to read something by her. Also, I haven't read many, if any, books set in World War I yet, most of them have all be WWII, so I was super curious about that as well. The year is 1914, and young Poppy is a maid for the de Vere family. But with the war not ending anytime soon, and help needed on the frontlines, Poppy finds herself applying to become a VAD, Voluntary Aid Detachment nurse. This quickly thrusts Poppy into a completely different world than she has ever known, full of unimaginable horrors, but through these horrors, she begins to discover her place in the big world. The storyline and the setting for the book was really interesting. As I mentioned, I've not read many books set in the WWI time period, and I found the descriptions and story to be really engrossing. I was worried about the ending of the book, as it ended rather abruptly, then I discovered that there is a sequel, one where Poppy goes to help even closer to the frontlines of the war, and I'm super curious to check that book out as well. The one thing that didn't really grab me in the book was the romance between Poppy and Freddie, who was the son of the family she worked for. I fully expected it to be a swoon-worthy romance as described in the books summary, but it didn't work for me at all, unfortunately. However, I did see a few sparks elsewhere for Poppy, and I'm hoping that works out for her. Overall; I found Poppy to be an interesting read. 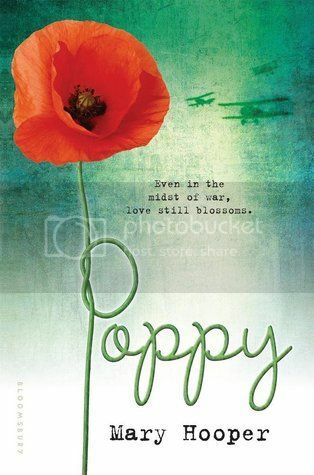 I enjoyed the storyline and setting, and I'm really curious to read Poppy in the Field, the sequel, when it's released. I read Fallen Grace a few years ago and really enjoyed it. I'm not a huge historical fan so I was surprised. This one sounds good too! Have you ever watched The Crimson Field? This sounds similar. I haven't read many WWI books, either!